Prime Minister Nguyen Xuan Phuc’s trip to Germany and the Netherlands, from July 5-11, was a success with numerous deals between Vietnam and the two countries being signed, said a Vietnamese Foreign Ministry official. 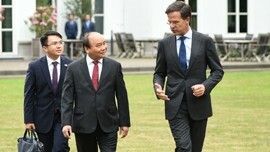 Deputy Foreign Minister Bui Thanh Son said this was Phuc’s first trip to Western Europe in his capacity as the Vietnamese Government leader and he was accompanied by representatives of more than 100 businesses. During the visits, the leaders of both Germany and the Netherlands affirmed Vietnam as an important partner in ASEAN and spoke highly of the role played by the country in the ten-member group, he said. They agreed to enhance the exchange of delegations in order to intensify mutual trust, the official added. According to Son, the main focus of PM Phuc’s trip was to foster economic, trade and investment ties with the two countries. All proposals raised by Vietnam to expand trade and investment co-operation, as well as affiliations in science-technology, education-training and national defence and security received positive responses from both Germany and the Netherlands. German and Dutch businesses also showed an interest in partnering with Vietnamese firms and want to take advantage of this opportunity for collaboration. In this spirit, forums, round-table seminars and exchange programmes connecting Vietnamese enterprises with those from Germany and the Netherlands were held during the trip, Deputy Minister Son said. Addressing around 1,000 German and Dutch businesses, PM Phuc said that Vietnam is making all-out efforts to build a facilitating Government that serves the public and businesses. On this occasion, 36 co-operation documents, worth a total of EUR4 billion, were signed by Vietnamese enterprises and their German partners, with a focus on aviation, personnel training in health care, agriculture, the food industry and renewable energy, among others, Son said. Meanwhile, he added, Vietnamese and Dutch enterprises agreed to work together in the fields of natural disaster response and mitigation, infrastructure construction, navigation and inland waterways, shipbuilding and cattle-feed processing. Germany and the Netherlands also expressed their interest in cooperating with Vietnam in the fields of culture, education-training, labour, climate change response, water management, high-tech agriculture, seaport tourism and logistics services. Regarding PM Phuc’s attendance at the G20 Summit, as the host of APEC 2017, Deputy Minister Son said Vietnam’s presence at the event reflects its advanced position in the regional and international arenas. Vietnam contributed opinions in most major meetings of the summit, he said, noting that many recommendations raised by the country relating to international co-operation, regional and international efforts in handling global economic issues, sustainable development, sustainable use of water resources and human resource development, in the context of the fourth industrial revolution, were mentioned in the summit’s joint statement. Vietnam also worked to promote common interests and concerns of developing countries, while discussing matters such as international trade-investment, climate change combat and global economic administration, Son said.